St. Patrick’s Day is a holiday guaranteed to make Irish out of a lot of people, including those who aren’t Irish. In addition to the holiday’s traditional green festivities, of course, the Irish food suddenly flies off the shelves. Aldi carries a lot of it: some of it as Special Buys (ALDI Finds), but some of it as Regular Buys, too. Here we take a look at two popular components of a St. Patrick’s Day feast. If you have other Irish items you get from Aldi, let us know in the comments! Making a traditional corned beef and cabbage isn’t hard, but it does take time and it helps if you have a sense of 1.) the timing of everything and 2.) the right tools. Let’s start with that second point. If you decide to cook this dish, I highly recommend a 12-quart stock pot. You can get by with a 4-quart Dutch oven (I’ve done it), but you’ll be moving things in and out of the pot a lot and it will take longer for everything to cook. A large stock pot can hold most, if not all, of the ingredients at once, which helps streamline the process. Aldi, for its part, does occasionally sell a stock pot in the form of the Crofton 12-Quart Stainless Steel Stock Pot, but Aldi doesn’t necessarily sell it around St. Patrick’s Day, so you’ll need a bit of foresight if you intend to get one for St. Patrick’s Day. Alternatively, most big box stores sell them. Beyond that, it helps to have a good pair of tongs and a metal spatula for moving the beef, a good cutting knife for slicing the beef, and a large ladle for moving things out of the stock pot when you’re done. Aldi corned beef is competitively priced compared to other stores, and I have seen it discounted even further right before St. Patrick’s Day. On the other hand, I’ve seen Aldi stores sell out of corned beef during that time, so it’s a calculated gamble to wait until the last minute. If you know you want corned beef, get it ahead of time. Cattleman’s Ranch Corned Beef Brisket gives a couple of cooking options, including baking and simmering. This recipe calls for simmering. To do so, I placed the corned beef in the stock pot, added the spice packet (which comes inside the corned beef package in a separate pouch), and then filled the stock pot with water to about an inch above the beef. The directions call for simmering the beef approximately 50 minutes for each pound. I typically opt for about 4 pounds of beef, so for me 200 minutes — 3 hours, 20 minutes — is the common time frame. Because it takes a while to bring the water in the stock pot to the simmering point, and because the beef has to rest afterward, you should add about an hour of total prep time to the cook time. A stock pot can get pretty full by the time you get to the cabbage, so if needed, you can put in part of the cabbage and then cook the rest while the beef is resting. I’ve made this recipe with both all-Aldi products and all non-Aldi products. To my family, they taste indistinguishable. The Aldi corned beef is every bit the equal of other corned beef brands I’ve purchased, and the veggies taste the same, too. This is a traditional bread that rises because of baking soda rather than yeast; hence the name soda bread. Aldi sells this mix in a box, and all you have to do is add milk, stir it a bit, and bake it. To prepare this soda bread, preheat your oven to 400 degrees and grease a round 9-inch cake or pie pan. Add the bread mix to a medium-sized bowl, make a well in the center, and add one cup of milk. Mix using a rubber spatula, mixing in a full circular pattern until combined. Do not overwork the dough. Turn out the dough onto a well-floured cloth (I used a floured cutting board) and form into a ball (do not over handle). Pat down to form an 8-inch circle. Place the dough in the pan and cut a cross on top of the dough that goes from edge to edge. Tradition says a cross is cut into the dough to “ward off the devil.” Bake at 400 degrees for 30-35 minutes until top is golden brown. This mix makes about 15 servings. It makes a good hearty, rustic loaf of bread that is a nice complement to your corned beef and cabbage meal. It tastes delicious sliced and spread with some butter, and it’s best if you eat it while it’s still warm from the oven. It’s not as good the day after baking, as it tends to get dry. Aldi, German company that it is, nevertheless makes a mean Irish St. Patrick’s Day meal. 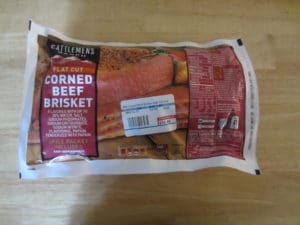 Its corned beef and cabbage is every bit the equal of what you could get from any grocery store, and its components are available year-round as Regular Buys to boot, including the Cattleman’s Ranch Corned Beef Brisket. 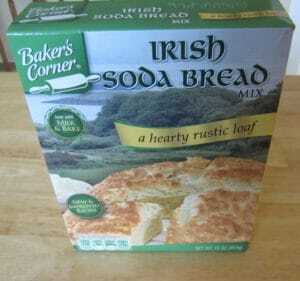 The Baker’s Corner Irish Soda Bread is also good, but it’s a Special Buy, so you’ll have to wait for the holiday on this one. AK&N, Baker's Corner, Cattleman's Ranch, Grimmway Farms, Old Oak Farms. Bookmark.